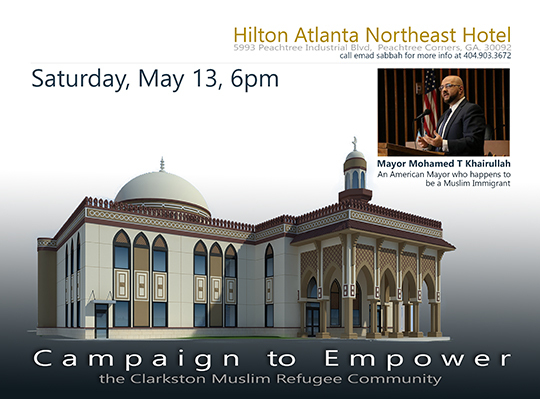 We appreciate your continued support and hereby would like to invite you to our next Fundraising Banquet in Hilton Atlanta Northeast Hotel on May 13 at 6pm. You can purchase the tickets online by clicking on the above picture or via the Masjid website . Come and listen to a dynamic speaker, Mayor Mohamed Khairullah, who is an American, a Muslim, an immigrant, and an elected mayor of a major American city. We plan to provide free babysitting services for children under 13. The good news is that construction work of the New Masjid & Community Center is resuming. Given Allah's Help and your donations, we have $250,000 in the construction account to sustain the work during May and part of June. We need your support to continue the momentum. Please click here to donate online via PayPal's secure site. Most Georgia bound refugees make their first homes in Clarkston. The nascent influx of refugees from Myanmar and Syria demand our collective efforts in accommodating their most basic needs. Your contributions towards the building of the new Masjid and Community Center go a long way in providing religious, educational, and social services to these and future immigrants. Support the Refugees of Clarkston by restoring their dignity and by giving them a sense of belonging... Let's give the refugee families a place of worship and a community center. Let us empower the weak, the needy, and the disheartened among us. We are the Ansaar of modern times. The Refugees are the Muhaajireen. We have a very rich Sunnah to model our behavior and actions after and to help those in need of re-settlement. You may also wish to donate regularly without the hassle of logging in to PayPal, sending checks, or taking cash to the Masjid. You can fill out the Auto-Debit form with your checking or credit card information and either mail it to the Masjid PO Box address or hand it over to the Imam at the Masjid. Please visit the New and Revised Masjid website that is redesigned from scratch to be device independent. The website now automatically adjusts to various screen sizes from mobile phones, to tablets, PC's, and larger screens.